Facebook’s billionaire CEO Mark Zuckerberg is screwing over the Internet. Again. We are so close to stopping Fast Track for the secret Trans-Pacific Partnership (TPP), but now Facebook is lobbying for it. Tell Facebook CEO Mark Zuckerberg to stop promoting Internet censorship! Internet users from across the political spectrum overwhelmingly oppose the secretive Fast Track process, which would allow government bureaucrats and industry lobbyists to make important internet policy decisions in secret. 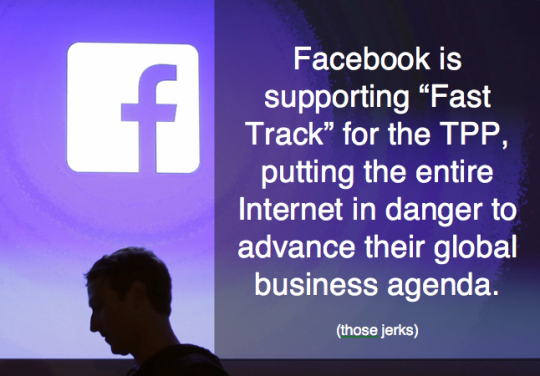 Thousands of websites and tech companies oppose Fast Track too, from tiny startups to hugely popular services like Tumblr, imgur, and reddit. But at a time when every vote counts and Congress is taking stock of where tech companies stand on these bills, Facebook is stabbing their users in the back and endangering all of our rights. Facebook CEO Mark Zuckerberg has built his fortune on the back of the free and open Internet. He should be ashamed that his company is now helping hasten the passage of the TPP’s draconian copyright provisions. If enough of us sign this petition, it will send a message to other tech companies at a time when we need as many of them as possible to vocally oppose the Fast Track bills. Click here to tell Facebook CEO Mark Zuckerberg not to put us on the Fast Track to censorship! P.S. We are now up against two deadlines: trying to stop the TPP and the reauthorization of the PATRIOT Act in the same month. Will you chip in $5 to help us go hard on both?